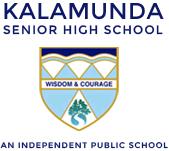 Kalamunda Senior High School prides itself on offering opportunities for students to extend and enrich their academic studies. The Academic Excellence Program has been running in the school since 2004 and is designed to support our top academic students in achieving excellence in all areas of study. It not only develops academic talent but also leadership, resilience and persistence, all to enhance each individual student’s ability to achieve success at school and beyond. Students are streamed together for English, Mathematics, Science and Society and Environment so that they are able to work at a pace more suited to their needs. Excursions, guest speakers, special programs and links to University programs are all available to these students. In addition the Academic Excellence Program Coordinator works closely with the Student Services team, in particular the School Psychologist, in running a wellbeing program for these students. Part of the program aims to help students deal with the stress and pressure sometimes experienced by high achievers.